I'm a OSX user and was wondering if where possible (or perhaps plans) to use the imodela via OSX and Linux? Perhaps it's possible to directly send nc/gcode to the USB port? Maybe some documentation about the protocol that is used to control the printer? This way I would be able to create my own drivers for OSX and Linux. I would be happy to share them when finished. As of yet the iModela will only be supported on Windows. MP4 running the MDX-20 on an iPad. In fact all the Roland machines I have can be accessed and remotely controlled from a single iPad or iPod if your eyesight is better than mine. Many years ago I started playing with Pocket PC's (PDA) trying to get them to control the CNC machines I operated. Now with the the iPad I can "administer" all my cnc devices from it, anywhere our network is accessible. The iPad isn't actually running the software but operating a remote desktop application. All the cnc machines here operate from what I call headless PC's (no keyboard, screen or mouse). They are all networked and run remote desktop, this also includes a cnc router run from EMC2 (Linux). The PC's can be anything including laptops with defunct displays, even a webcam can be operated to keep an eye on the job and make sure it hasn't caught fire or taken up break dancing. The Mac (OSX) can also be used to remote administer if you choose and files sent from it to any of the Roland machines you have. I use a Mac for all the design work I do, then transfer the files onto a networked drive. Using the iPad directly at the machine makes for simple control and monitoring, no fumbling for keyboard, running out of space for the mouse or a cricked neck trying to watch the monitor whilst setting the cutter. joules, that setup is real cool you have taken this cnc lark to another level i take my hat off to you sir. Cheers Chevy6600 been quite busy just recently, had quite a bit of interest from the guys I have been demonstrating it too, works very well with our vinyl cutter. Laptop under the bench out the way, iPad slots into a stand over the cutter. Makes my old cutter look really high tech especially when I lift it out and manage the cutter all wirelessly as it doesn't seem to have a computer controlling it. I think any tablet can be used to do this as Android support remote console too, so if your CNC ambitions should grow!!! Joules, Looks like a perfect solution, maybe share some other photos or let others see how to set it up. Maybe give a little summary of what you do. Yes, please share if you can this application, would be great to use myself! What I meant was that there is a windows driver for the iModela (to output) and there is no plan for a Mac version of this. The software I use in iOS is called iTeleport, you then download each VNC server for Windows, OSX or setup the VNC server in Linux to function with iTeleport. The online help is very good in getting you going. I would be very wary of running this in a sensitive business environment, as the simple setup uses a Gmail account to establish communications. I am just a bit paranoid of relying on something that needs an external link or open port on our firewall when doing confidential work. However with a little more configuration work you can setup to run on a secure network with no problem. Just test it out talking to one PC from an iPad or iPod to see how simple the setup can be, then look at locking it down. I suspect this would be a great system for use at an exhibition where you might wish to go to a quiet spot to discuss operation of a machine whilst still leaving the main machine displaying a job. You can also have multiple iOS machines viewing one active machine, and use iPads as remote displays if needed. Mean while, back to my playing. A recent picture of the MDX being setup for a job using the iPad. Once you have finalised the setup and the machine is processing your work, you are then free to go somewhere quiet and carry on doing other work whilst monitoring progress remotely. 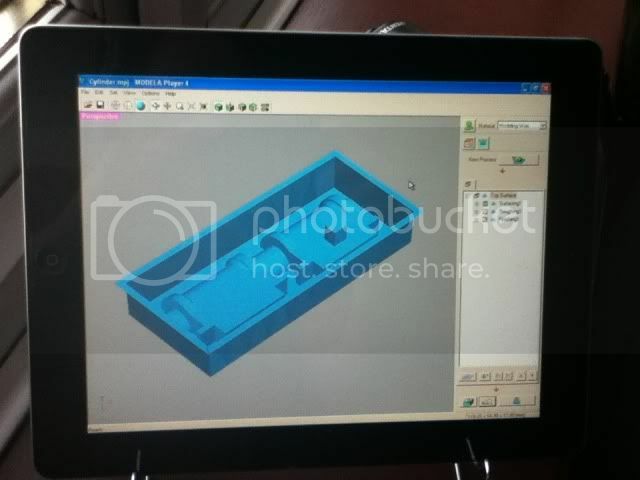 Here the iPad is in front of my CAD machine and I can see when the job has cleared the print queue.